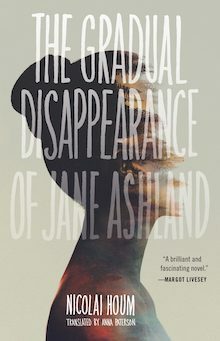 Nicolai Houm’s novel “The Gradual Disappearance of Jane Ashland,” translated from the Norwegian by Anna Paterson, opens with the titular protagonist in seemingly dire straits. Jane has been abandoned in a tent in the freezing wilds of Norway, a storm rages, she is out of food, and, perhaps most chilling to the modern reader, her smartphone is dead. What follows is indeed a survival narrative, but not a wilderness one. Jane is trying, though at times not very hard, to find her way after a heartbreaking trauma, the specifics of which are at first hinted at and then, eventually, spelled out. The novel nods in the direction of thriller, but is more a study of tremendous grief. And yet, it’s not a sad book per se. The action is as brisk as the weather, the tone energetic. This is Nordic, but neither noir nor Knausgård. Jane is an American writer of some accomplishment, a professor of creative writing at the University of Wisconsin, until in the wake of a trauma she gives up writing (believably) and her faculty position (less so) to seek her family origins in Norway, a country she’s never visited. She stays for a few days with a Norwegian family who may be distant relatives. The family members each have different reactions to Jane, along with their own idiosyncrasies, and Houm exploits the awkwardness of being a houseguest in a foreign culture to good effect without lapsing into sitcom clichés. After her stay with her relatives comes to an abrupt end, Jane tags along on an expedition to study musk oxen with Ulf, a handsome Norwegian zoologist whose athletic physique seems to owe less to the gym and more to central casting. That said, the interactions between Ulf and Jane do take on a certain energy and mostly avoid the simplistic “me Ulf, you Jane” trope that might be expected here. Throughout, Jane ingests alcohol and pills in amounts that would impress even Wisconsin undergraduates, but their effects lean more toward dark comedy than tragedy. Interspersed with the present action in Norway are scenes from Jane’s previous life, going back to childhood and including an extended look at her courtship and marriage. The non-linear arrangement of the novel echoes the way Jane’s life has fragmented in the wake of tragedy, and the eventual depiction of that tragedy is handled with restraint, but not avoidance. Houm is well-positioned to understand Jane’s interaction with Norway and its citizens: while Norwegian himself, he spent a portion of his childhood in Wisconsin. He also seems to rise to the challenge of writing a convincing female protagonist, both in my own (male) opinion and that of several female reviewers. Per an interview with the author on the podcast “Absolutely Novel,” Jane’s character began as a male Norwegian, but Houm felt the need to put more distance between himself and his protagonist, presumably to be less constrained in the directions the novel might go. Jane also moves between experiencing her life and viewing it at some distance, as if she were a character. While she no longer writes, she still sees the world through the lenses of her craft. Houm thankfully avoids both the snark and the self-seriousness that often accompanies the writer-as-protagonist, and instead uses the occasional bit of metafiction to develop Jane’s character and poke fun at writing, usually his own. The conclusion of this relatively short novel (228 pages) perhaps tilts more toward bleakness than redemption. There are hints of forgiveness, both of self and others, but the book rightly seems unconcerned with a tidy ending. When we leave Jane, she is still engaging with the world, still moving, still thinking as both writer and protagonist, fighting to retain her agency in the face of nature’s merciless contingencies. This is Houm’s third book, and the first to be translated into English. On present evidence, he is more accessible than many of the better-known Norwegian writers (e.g., Jon Fosse, Dag Solstad, Herbjørg Wassmo), and is perhaps, in broad terms, closer to Per Petterson in style. In one podcast interview, Houm said there were no current plans to translate his two previous books. So, unless readers are willing to go the full Lydia Davis and teach themselves Norwegian, this is it for the time being. One does hope for more.